Dr. Laura Stachel with a 'solar suitcase,' which powers two overhead LED lighting, charges walkie-talkies and cell phones and includes LED headlamps that come with their own rechargeable batteries. Standard medical supplies might seem like an important donation in developing countries but American obstetrician Laura Stachel saw the need for something even more basic: reliable power. Stachel is crouching on the floor of her Berkeley kitchen, which is cluttered with spools of wire, small solar panels and assorted tools. She lifts the cover of a black carry-on suitcase. There are no clothes inside, just a sheet of plywood mounted with four electrical components. Stachel quizzes aid volunteer Paul Lacourciere, who is leaving for earthquake-ravaged Haiti in a few days. He'll take the solar suitcase with him, and plans to deliver it by donkey to a remote medical clinic that currently depends on candles for light. 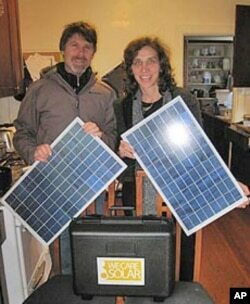 Stachel's husband, Hal Aronson, suggested a sun-powered solution to the power outages that hamper medical care in developing nations. "We have a charge controller that's regulating the energy that's coming in from the panel," says Stachel. "It's allowing us to store energy in the battery and not either overcharge the battery or else not overly discharge." Stachel may sound like a solar engineer, but she's not. The idea for the suitcase grew out of her work on maternal-child health in Nigeria. While observing a hospital there in 2008, she learned power was rationed for several hours each day. "One of the first cases that I watched, a C-section, the lights completely went out during a C-section and the physicians had to finish by flashlight," she says. "There were other situations where midwives were taking care of women who were bleeding to death and they needed emergency surgery and there was no phone system to call a doctor." Dr. Laura Stachel helped develop the 'solar suitcases' that are now used in nine countries. Stachel described the problems in emails to her husband, Hal Aronson, who promotes solar energy. He suggested a sun-powered solution. When she got home, they designed a large permanent solar installation for the hospital. But Stachel wanted a smaller version, first. "I asked him to create something I could bring in my suitcase that I could take through customs without having to declare any special equipment, and that would allow me to show workers in the hospital what LED lights were like, how walkie talkies worked, how we could recharge rechargeable batteries for the headlamps." Stachel says no one at the Nigerian hospital would let her take the trial suitcase away and she was suddenly getting requests for the power units from medical clinics all over Nigeria. Now she gets them from all over the world. That's how their organization, WE CARE Solar, was born. 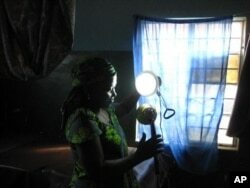 This solar-powered LED spotlight is tested in labor and delivery by a midwife. "We didn't mean to turn our house into the solar suitcase factory," says Aronson, "but it happened. It's been fun." The solar suitcases don't just provide light and communication. They can be expanded to power ultrasound and suction machines and other basic medical equipment. Stachel estimates that each suitcase costs about $1,000. There are about 20 units now working in Nigeria, Tanzania, Mexico, Haiti, and on the Thai-Burmese border. Stachel says she and her husband are trying to keep up with demand and funding. "One of our dreams is to be increasing the capacity locally by increasing training by getting shipments of equipments into countries and to teach people how to make solar suitcases where they live so they can have their own industries and can supply these for their hospitals and health care centers." In the meantime, there's a steady stream of visitors to their house. Before Lacourciere leaves, Stachel brings him a big bag of accessories to add to the suitcase. It includes items such as extension cords and batteries. "Multiple light bulbs, headlamps, anything you'd want to include and we have an instruction manual. We have it so far in English and French and Paul's team is working on making a translation into Creole for Haiti," says Stachel. Once Lacourciere leaves their home for his trip to Haiti, Stachel and Aronson remain at their kitchen table, working over another set of solar panels. An African doctor headed to Zimbabwe is coming by for his suitcase within the hour.